Nothing's more frustrating than sitting down to watch a new DVD or video file and realizing there's no subtitles in your language. Sometimes, even native speakers want to add subtitles to DVD movies or TV shows just so that they can more clearly understand what the actors are saying. Below are two easy ways to add subtitles to DVD movies or TV shows. 1. Convert your DVD to video. 3. Add the downloaded subtitles to DVD using some subtitle adding software. 4. Burn the movies with subtitles to DVD disc. After downloading and install this program, just load your media files by drag-n-drop. After successfully load your DVD video, you have two options to add target subtitles. Click "T" icon under the source file information, and then choose "Add Subtitle" option to load your subtitle folder. Click the pencil icon to access the edit window and then select "Subtitle" tab. Click "+" to load target subtitles, and then hit "T" to change the font, color, size, etc. Now all left is hit the Convert button to begin write subtitles to DVD. This program is very efficient, and very soon, you DVD file with subtitles is ready to use. 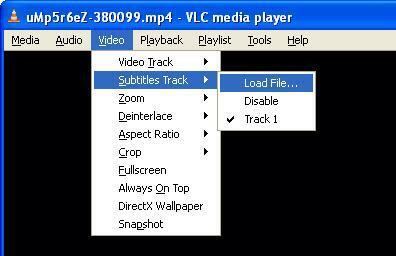 If you just want to add subtitle during the DVD playback, subtitle players like VLC can help. It natively supports subtitle overlay. 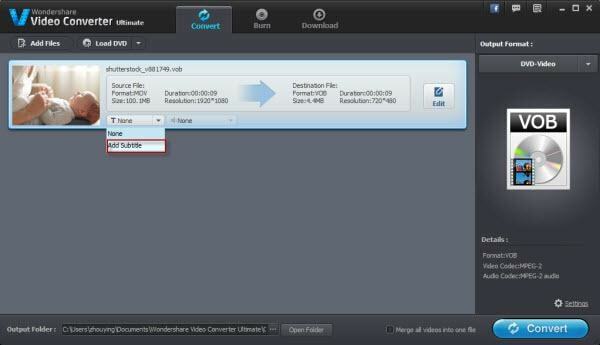 When you are watching a DVD movie or video, simply go to Video/Subtitle Track/Load File to add subtitles to DVD/video.